That would be Miss Mali. Her eyes are still blue, but if you look at them from the side they're already starting to fade. Her hair is coming in fast, and it's brownish. I keep trying to tell myself that it could be red, but that's really just her pink scalp peeking through and blending, or the yellowish cradle cap I'm trying to keep in check (perhaps I should start bathing her more than once a week, poor little thirdling). I have alluded to her becoming a more, erm, active and alert baby. She is fussy and needy during the day! Wants her favorite pacifier (Mommy) all day long, doesn't want to be put down. Oh well. Still sleeps soundly at night, which means that all is forgiven. She's still got some congestion going on, with big green boogers (this week's theme) in the A.M. The snot's been going on more than two weeks now. I should call the Dr. except I'm worried that they're just going to want to put her on antibiotics. 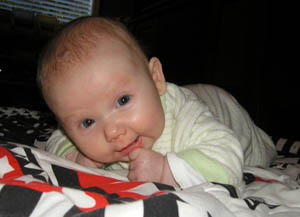 She is holding her head up routinely now when placed on her tummy (see picture). If you take her hands and pull her up off of her back, her head stays up rather than flopping back. Her whole body rises up like a board, though, not just her trunk (ack--stiff baby--early autism sign!). Despite that last parenthetical statement I think she's just strong: if I place her on my knee in a semi-sitting position so that she is reclining against me, she then sits upright all on her own. Batting at objects with remarkable concentration. You can see those little cogs turn as she does it, and it is remarkable! I love watching her look at everything. Her hands have unclenched, and she now strokes my hands or side, open-palmed, as she nurses. Little tiny warm hands. This is one of my favorite phases. I love three month old babies, as parents are their whole world. Everyone else is interesting, but Mali's whole being is focused on Mom and Dad. It's delightful, and we adore her right back, hard. Badger has translated a poem that taps into this fierce love--check it out. There has never been a baby like this baby, and there never will be again. Worship her!